This hybrid laptop finally gets things right with a thin and light design, and a vivid high-res display that'll steal your breath away. 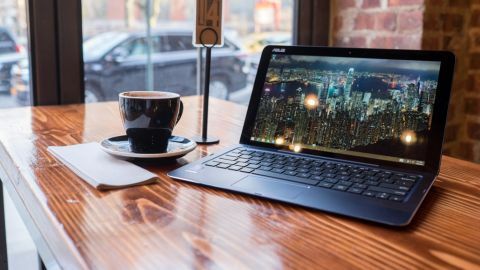 2-in-1 laptops have come a long way over the last few years from their bulky and clunky methods used to transform predecessors. Lenovo has perfected it's back flipping notebook with the Lenovo Yoga 3 Pro, sporting watchband hinges that practically blend in with the rest of the laptop's chassis. Likewise, Microsoft finally hammered out nearly all of the kinks out of its laptop-tablet concept with the Surface Pro 3. Now, Asus attempts to one up everyone with the Transformer Book T300 Chi, one of the thinnest 2-in-1 machines ever created. Like the Surface Pro 3, this machine's guts are stashed behind the screen, which lifts away from a Bluetooth keyboard base to be a standalone tablet. But by going with a fanless Intel Core M setup, Asus has brought us a convertible laptop that's even thinner than some tablets. Don't mistake this machine's svelte profile for lightweight performance, though. This machine can run with the best of them, but it might be best suited for media lovers. Right off the bat, the one crucial thing the Asus Transformer Book T300 Chi gets right is that it looks and feels like a traditional laptop. Most hybrids are heavy and lopsided, putting most of the components behind the display. The T300 Chi, on the other hand, feels well balanced despite the tablet portion being just a few fractions of a millimeter thicker and ounces heavier than its keyboard base. Beyond aesthetics, using the T300 Chi feels as natural as any laptop. You can easily place it on your lap and type away a document without worrying about it teetering backwards from the extra weight of the screen. Plus, it folds into a thin 0.65-inch (16 mm) package with the thickness of the tablet and keyboard combined. To get the Transformer Book T300 Chi to such a thin profile, Asus used rare earth magnets to keep the laptops two distinct parts together. By doing so, Asus was able to avoid the bulky locking mechanisms that have plagued other machines, such as the Toshiba Satellite Click 2. Although the Transformer Book's tablet and keyboard sections aren't locked together with a hard connection, the magnets feel more than secure. I can easily lift the laptop by the keyboard, turn it upside down and shake it without worry about the screen slipping off and crashing onto the ground - in case you ever happen to do that. That's not to say they're inseparable, either. With a quick tug, you can pull the screen away from the keyboard base. Slipping the display back on is fairly simple, but I often have to look behind the hinge to make sure I'm lined up correctly and to check whether the top portion of the machine is fully seated. The whole laptop itself is pretty snazzy, too. It's made entirely out of aluminum anodized with a sparkling deep blue finish. The machine also has chamfered, "diamond cut" edges galore on the outside edge of the keyboard deck, the inside track around the trackpad and around the perimeter of the screen lid. They're a nice touch, especially for resting my wrists on a softer front edge of the palm rest. Of course, going with such a thin form factor also introduces compromises, and Asus's latest Transformer Book suffers from a case of having only micro size ports. Around the perimeter of the screen, you'll find a micro USB 3.0 port, micro HDMI and a microSD card slot on the bottom edge - even the Bluetooth keyboard features a mini USB charging port. If you're planning on plugging in anything into this laptop from USB drives to a monitor, be prepared to bring along an adapter or some extra cables. Luckily, Asus includes a mini USB 2.0 to the full-size port adapter, so users won't be left up the creek without a paddle. However, if you want to fully utilize the T300's USB 3.0 port, you'll need to purchase a $29 (about £19, AU$37) micro USB 3.0 dongle from Asus or look for a third party solution.